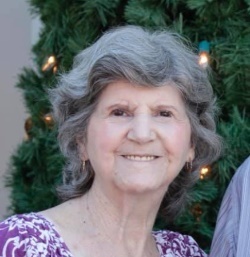 Obituary for Nora M. (Boudreau) Belliveau | Boucher Funeral Home, Inc.
Nora M. (Boudreau) Belliveau, 80, of Gardner and Florida, passed away peacefully Monday, February 4, 2019 in her Winter Garden, Florida home surrounded by her loving family. She was born January 21, 1939 in Acadieville, NB, Canada to Emile & Bertha (Legere) Boudreau and was the oldest of 15 children. Left to honor Nora and remember her love are her husband of 54 years, Roger Belliveau; three children, Lisa (Glenn) Stanley, Donald Belliveau, Rachel Duguay; two grandchildren, Matthew and Sarah Duguay; siblings, Florine Comeau, Thomas (Norma) Boudreau, Rosa (Alfred) Cormier, Auguste Boudreau, Fidele (Diane) Boudreau, Claude (Francine) Boudreau, Emile Jr. (Jeannette) Boudreau, Gerald (Cheryl Tenney) Boudreau, Doris (Norman) Arsenault, Lucille (Roger) Vautour, Elie (Paulette) Boudreau, Yvette (Ernie Leblanc) Cormier; brother-in-law, Ovila Comeau; numerous nieces, nephews, cousins and friends. Nora will be greeted in heaven by her parents Emile & Bertha; sisters, Jeannette and Ida; brother-in-law, Felix Comeau; niece, Erika and nephews, Dean and Justin. Funeral Services will be held Saturday, February 16th from the Boucher Funeral Home, Inc., 110 Nichols Street, Gardner with a Mass at 12:00 p.m. in Annunciation Parish/Our Lady of the Holy Rosary Church, 135 Nichols Street, Gardner. Burial will be held in the Spring in Notre Dame Cemetery, Gardner. Calling hours will be held Saturday, February 16th from 9:30 a.m. to 11:30 a.m. in the funeral home. In lieu of flowers, memorial contributions may be made to the Alzheimers Association, 309 Waverley Oaks Road, Waltham, MA 02452. (www.alz.org) Please reference in memory of Nora M. Belliveau.